With a state-of-the-art campus, unmatched industry resources and a faculty of internationally recognized experts, there area few big reasons why UCF’s Rosen College has grown to be the largest hospitality college in the nation with an renowned reputation for producing outstanding graduates and industry leaders. Are you next? Take your first step toward advancing your education and career in the hospitality industry by applying for one of our undergraduate or graduate degree programs. 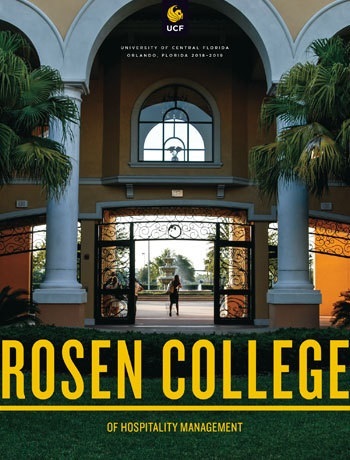 Take a look at the UCF Rosen College Undergraduate Viewbook by clicking on the image. Rosen College offers convenient, on-campus housing that enables students to live, learn and work in the heart of the hospitality and tourism corridor. Residents enjoy a variety of amenities, including study lounges and free laundry facilities on each floor, complimentary coffee in the concierge lounge, a central community center, free parking and a heated pool. They can also take advantage of resident-only opportunities like Behind-the-Scenes industry trips and networking events with employers who recruit directly from Rosen College. Visit the Rosen College Apartments today! Learn more.